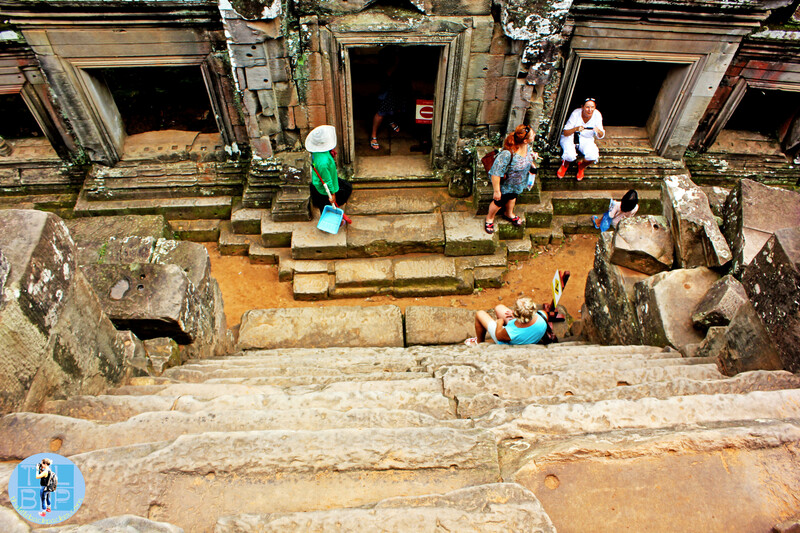 Angkor Wat is Cambodia’s biggest tourist attraction, but there is far more to the Angkor Temples than just Angkor Wat. You have a choice of a one, three or seven day tickets however – being short on time we opted for the one day ticket and were completely satisfied. Our one day tour of the temples started at 4.30am; seeing as sunrise was not until 5.30am I did think that was a bit early… That was until we were the first people to arrive and managed to grab an awesome spot. That was after a quick stop at the ticket office on the way, where they take your photo and produce a ticket containing the photo. Including this stop it took around 30 minutes to reach Angkor Wat and make it in to the temple. Having rocked up before most for sunrise we were able to stand right in front of the pond and get some great images of the temple outline as darkness started to fade away. Come sunrise there were hundreds of people gathered around us, waiting for the magic moment. Unfortunately the day we went the sky was full of cloud and we never experienced that ‘magic moment’; realising this we made a quick escape towards the temple itself. As most people were still watching the sun we had most of the temple to ourselves. It was so quiet and peaceful in the early morning air. Following the signs we made our way around the temple noting things from the carvings and patterns decorating the walls of the main courtyard where much of the temple was closed off. A warning: beware of the people offering you incense sticks and showing you how to pray as they are only doing it for money! Angkor Wat has been maintained and restored to keep it looking like it did in the good old days;, it is iconic and forms such a beautiful silhouette from the outside, however it wasn’t my favourite of the day as I was soon to realise. Our second stop of the day was Angkor Thom and the Bayon temple. Parts are maintained and there was some work being carried out while we were there. However most of it is left to ruins;, this meant there were a lot of uneven surfaces and climbing amongst rocks of uneven height. In this temple there were faces everywhere in the rocks and it seemed with every way you turned there was a face looking at you. There was nowhere to escape them! The colouring of the rocks and moss growing all over the surface of the ruins made this temple feel very different to Angkor Wat. The only thing that put me off a little was how busy it was in some of the areas as huge groups were being shown around. 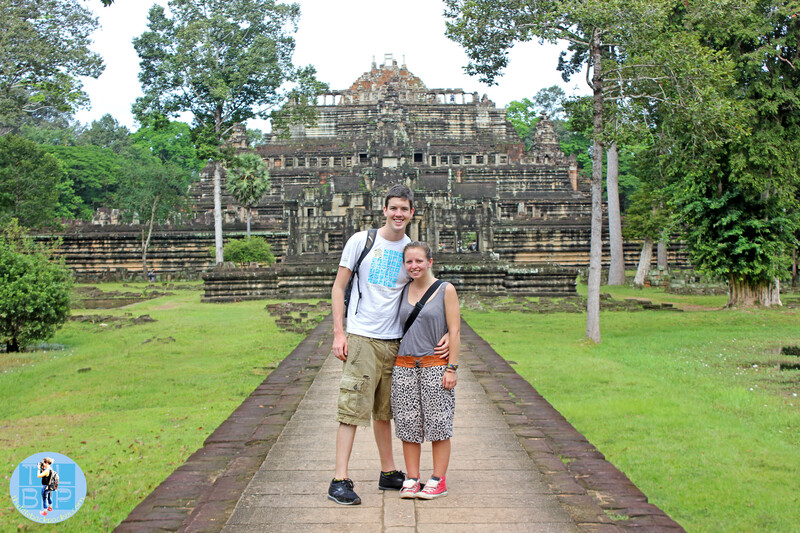 We explored the rest of Angkor Thom, getting lost on several occasions and not really knowing what we had seen. Most of the temples had an abundance of steps and one (Baphuon Temple) asked me to cover up my shoulders as a mark of respect. We moved on from Angkor Thom realising that even though it was only 8.30am we had completed two thirds of the main temples. Still, the heat was rising and I was very glad we had set out early. We visited a few smaller temples; Chau Say Tevoda and Ta Keo. At these temples there were dozens of small children wandering around trying to sell you things – anything from postcards to bracelets to pieces of wood that made a noise. Most of them were tiny and cute and I could easily have spent $10 buying crap I didn’t need. Instead I just said no to every single one. It felt mean and was really hard but I really didn’t need the stuff; nor would it help the children. I was surprised at the amount of kids around the smaller temples compared to the larger ones. 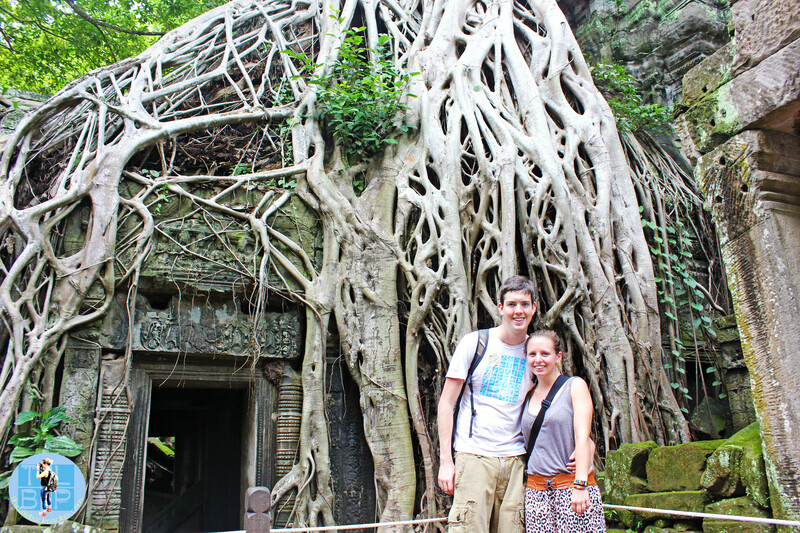 Our next big stop was the Ta Prohm or, as its more famously known as: the Tomb Raider temple. I loved this stop but I hated how busy it was. The whole place has been left as it was found and now you have trees growing over the temple and among the piles of fallen rocks. Some areas were closed off from the rubble but there were also a lot of different paths through the temple. Not wanting to get stuck in the areas of crowds we went around the temple in our own way which only meant we got lost – several times! The areas of the temple used significantly in Tomb Raider were packed with people wanting their photo taken in front of it. These areas were so annoying and made my visit to this temple not as great as it could have been. Again there was an abundance of kids trying to sell you things. By this point there were two places left to visit on the short circle, which was a good job because we were starting to get hot and annoyed with the constant pestering to buy something. 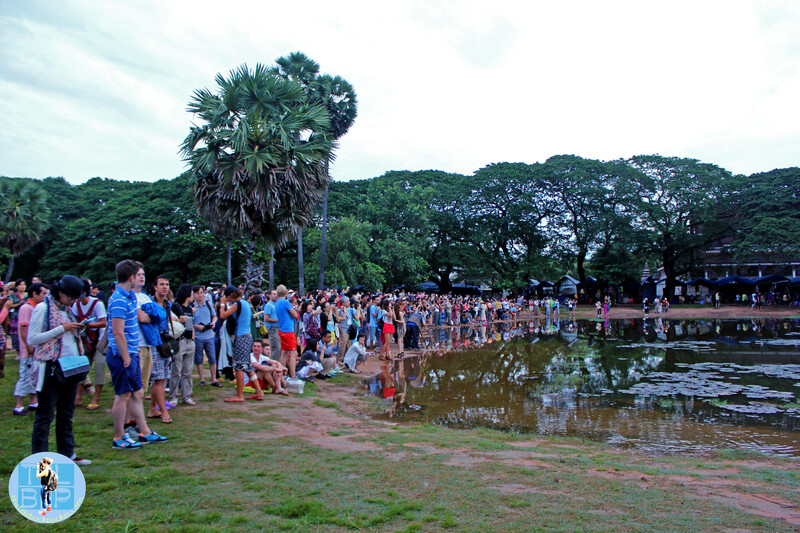 The last places were Banteay Kdei and Srah Srang, although there was not much to see at the second one. I found the kids the worst here but I was grateful for the quieter temples. It was only 1.30 pm but with the temples completed we decided to head back instead of visiting somewhere from earlier. After nine hours of the temples we were hot, tired and ‘templed’ out. Yes, the stairs really were this steep! • Cover up your knees and shoulders – they may not be practising temples but it’s respectful and some of the temples do have dress codes • The begging children were cute but oh so annoying. I felt pity for them but they were my biggest annoyance of the day. We used a Tuk-Tuk to get to and around the temples; we booked this through our hostel for $15 – I’m sure if you flagged one off the street and haggled you may get a cheaper price. Our guide wasn’t that knowledgeable but he was amazing at spotting us from afar. I loved our day at the temples despite it being long and tiring. The difference in all of the temples was so much more than I imagined and although I did feel temped out at the end of it, our day was exciting and full of culture. I certainly preferred the old ruined ones to the iconic Angkor Wat. Hi, I will go to Siem Reap in October and only have one day to visit Angkor Wat complex. Would you like to recommend me which temple that should not to be missed in one day tour? I know it’s really huge and I don’t know how long distance from one temple to another temple. Hi Rizka, all the temples mentioned were seen in just one day, I’d say it was the perfect amount!